This weekend sees the team at KAIJU! host a fundraiser for Beyond Blue at the brewery. The event is in honour of a beer lover, rep and barman who took his own life late last year. Here, KAIJU! co-owner Callum Reeves pays tribute to Benji Bullen. Nat and I met Benji Bullen when we were just starting out in the beer industry. He was working as the sales rep for Kwencher Beer at the time, and we happened to be pouring beers at a lot of the same events. It was easy for us to become friends with Benji. We were from a similar area, shared a similarly base sense of humour and we all loved big, hoppy beers. Benji’s love of beer and the community surrounding it is on full show with his Facebook page, Beer Selfies. The concept is simple – drink a beer, snap a selfie. No judgment about the beer, no judgment about what you look like, extra points for having your #pinkyup, but god forbid the beer isn’t open in the shot. There are more than 1,000 members and it is one of the nicest communities I know of on Facebook. 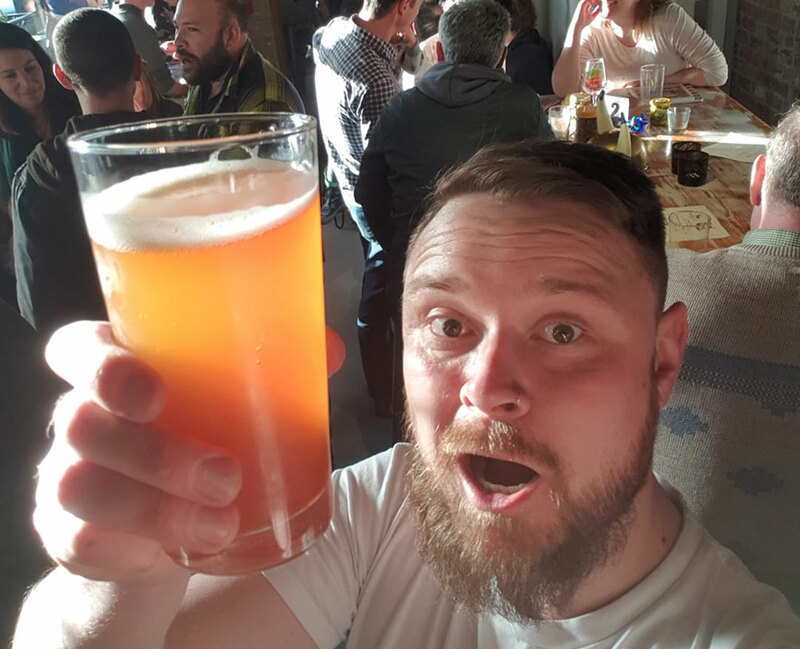 After finishing up with Kwencher, Benji spent a few years out of the industry, so he was understandably excited when he had the opportunity to be part of the team at The Fat Goat, a micropub that was planning to open in his local area. He took on this role with gusto, and worked closely with the owners to launch what is a truly special beacon of quality craft beer in the Dandenongs. It became a favourite destination for many of the KAIJU! team. We always had fun hanging out with Benji, and we were stoked when we were able to brew a collab beer with the Fat Goat crew for their Oktoberfest day as part of the Upwey Foothills Festival last year. The beer and the day were a massive success. They ran out of food after only a couple of hours and the ZiegenWeizen Hefeweizen we made for the day was sold out soon after. I really only had time for a quick hello, half a beer and a quick goodbye after my family and I had taken a wander around the rest of the festival. Benji seemed rightly stressed about making the day right, and I didn’t want to get in the way of that. It was only a couple of weeks later as I was driving to work when Len, one of our sales reps, called me and said he’d had some bad news from Ian, the Fat Goat’s owner. I pulled over. Something in Len’s voice told me this wasn’t about something trivial. When Len confirmed my worst fear – that Benji had taken his own life over the weekend – I sobbed uncontrollably. It seemed completely out of left field, and I was just so sad for his wife, Sacha, and their kids. What would they do now? How could we help? I was also angry. Angry with Benji – how could he do this without giving his friends a chance to help? And angry with myself – maybe he did ask for help, and we just didn’t realise. You play scenarios in your mind of what you might have done that could have prevented it – as if that would help now. Even now, months later, I’m fighting back tears, with a lump in my throat writing this, because I’m still upset that Benji’s gone, but also because of how powerless this has made me realise we all are, and how fleeting our hold on this life is. I really wanted to be able to say that I don’t know how anyone gets to a place where suicide is the right decision. The truth is that, although I’ve never had the black dog of depression growling at my door, I know how easy it can be for your mind to tell you stories about your self-worth, that somehow your friends and family would be better off without you, when the reality is so very opposite. I also know that alcohol can make these kinds of feelings much worse. Benji’s funeral was a testament to his popularity. There were hundreds of people packed into the funeral home that day. Some beautiful and hilarious stories were shared about the impact this guy had made on so many people’s lives. The memorial, held at the Fat Goat later that day, was also telling, where we got to meet so many of the people whose faces we had come to know through Beer Selfies. Benji Bullen with another Beer Selfie at the Fat Goat. 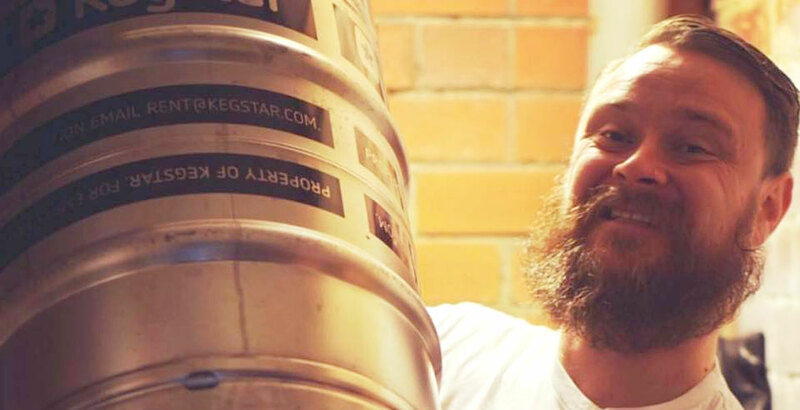 We donated the proceeds of two kegs we sent to Benji’s memorial to a GoFundMe page started to help get Benji’s family through this difficult time, but we hoped to be able to do a lot more. So, along with Sacha and a group of Benji’s closest friends, we came up with the idea to hold a brew day dedicated to Benji and the Beer Selfies family at KAIJU! this Saturday. We’re calling the beer we brew on the day #pinkyup Belgian Pink IPA, and it will be a collaboration with Benji’s homebrewing partner, RJ, Sacha and Benji’s mates. All the ticket sales, beer sales on the day and sales of the completed #pinkyup beer will be donated to Beyond Blue. As brewers we are caught between the fun, positive elements of the communities around the beers we love to brew, and the reality that we are making a product that can also ruin lives. I think it’s important for us to recognise this and to take steps to ensure that we spread the message to our communities that there is help out there, and you should not be afraid or embarrassed to seek it. Organisations like Beyond Blue are there to help you when you need it. Your friends value you, and they will be there if you tell them you are struggling. I hope that by shining light on anxiety and depression, and the potential impact alcohol can have on these conditions that we can normalise conversations around this difficult subject and help people seek help at the first signs of a problem. At time of publication, there were only a couple of tickets left for Saturday's event. Anyone who would like to donate to the fundraiser can do so here.